Bonnie has done her homework and discovered that St. Peter’s opens at 8:15 in the morning. 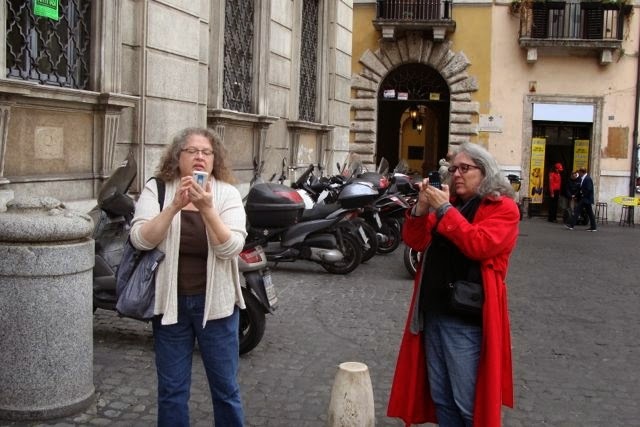 Thus we get up early, have breakfast at Navona, and grab a cab to St. Peter’s. It’s always an overwhelming experience to be in the space. Bonnie wants to see the Pieta, and does, but is dismayed that we have to stand so far back from it (all thanks to that Hungarian artist who had at it with a hammer). We walk around a bit, taking it all in, or as much as is allowed to us in our brief time there. 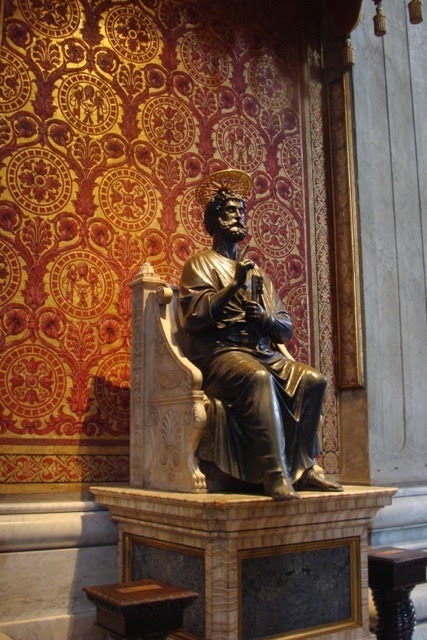 I always like the enthronement of Peter, and touch his toe as is demanded by tradition. 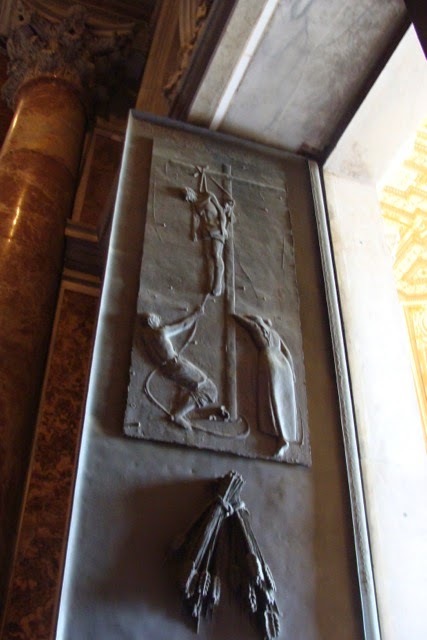 There is one thing that I want Bonnie and Wendy to see, however, and that is the Manzù doors on the south side of the main doors of the basilica. 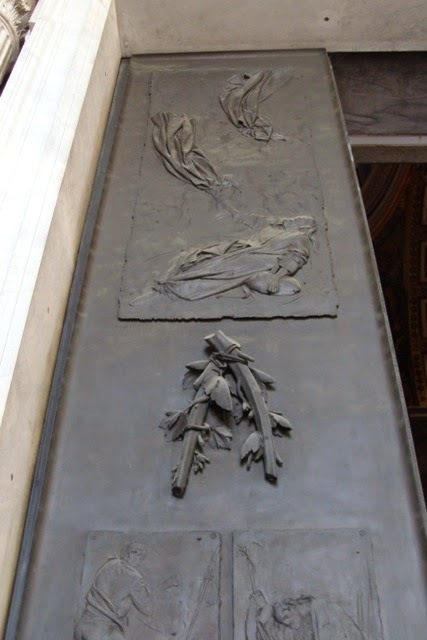 Commissioned by John XXIII, and created by Giacomo Manzù around 1964, the doors are commentaries on Death. They were controversial in that Manzù, a communist, was believed to have inserted into his realizations statements about the executions of fascists during and after the Second World War. The theme of death is appropriate to the door in that it is the door from which funeral processions both enter and leave. 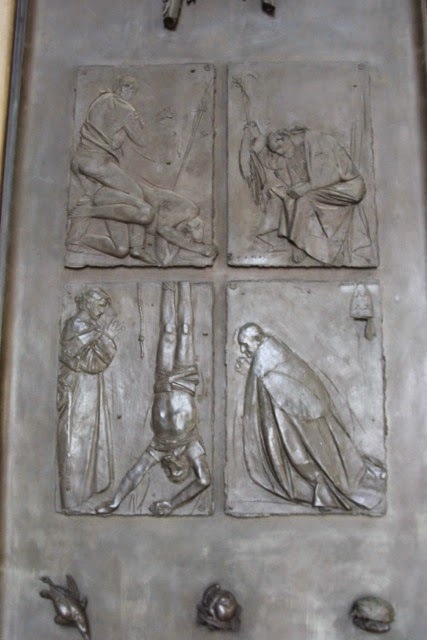 Several deaths are depicted on the doors, Jesus, Mary, Abel, St. Joseph, St. Peter, John XXIII, St. Stephen, and Gregory VII. I find the shafts of wheat and grape vines to be especially beautiful. It is a subtle indication of the Eucharist, the foundational reality of the assembly that enters here. At the bottom of the doors small creatures are depicted: a black bird, a dormouse, a hedgehog, and owl, a tortoise and a raven. I find the whole ensemble to be quite moving, both artistically and spiritually. We cab back to the apartment, grab our bags, and then cab to Termini where we relax until our 12:30 train to Florence. I've arranged for first class tickets - a treat for all of us. We arrive in Florence, go to our apartment, walk around a bit, and then crash. Of tombs and fortresses, saints, and kings. The time has changed here, so I’ve missed church, and we decide to cross the Tiber. 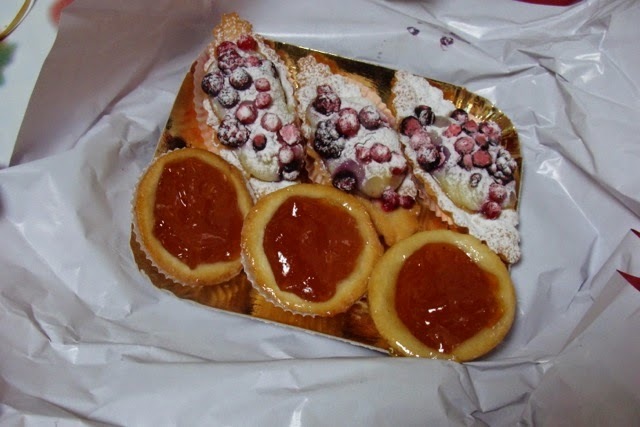 First, however, we need to partake of the pastries that I purchased the evening before at the pasticceria on Viccolo Savelli near the apartment that Anna and I lived in in 2000. Little boats filled with lemon crème and topped with fruiti di bosco, and apricot tarts make for a pleasant breakfast. We head out for Castel St. Angelo on the opposite bank. In spite of the many times that I have been in Rome, I’ve never been here – so this will be a treat. It’s a lovely day, sunny but a bit cool. 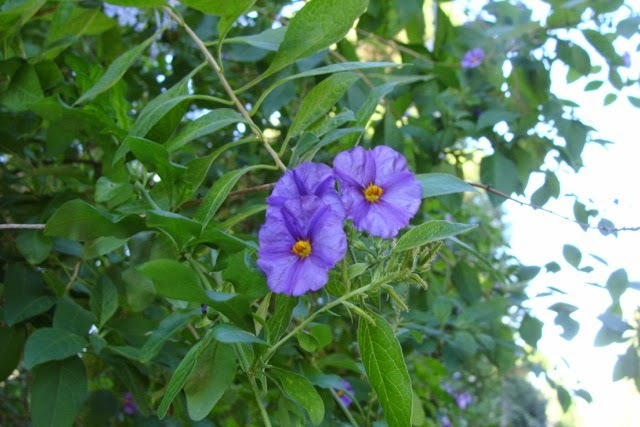 The umbrella pines are waving in the light breeze and children are playing in the parks. I buy a cheap (5 Euro) scarf just to head off the coolness. The Castel is (or rather was) the tomb of Hadrian – a circular hunk of masonry surmounted by an earthen barrow that had been planted with concentric circles of cypress and surmounted by a room for the remains of Hadrian and his family. 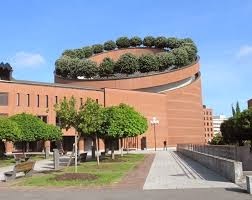 Mario Botta must have gotten his inspiration here. On top of that there were medieval and renaissance accretions, and the bulk of the masonry was pierced by a diagonal walkway that moves through the room that was used as the actual tomb. 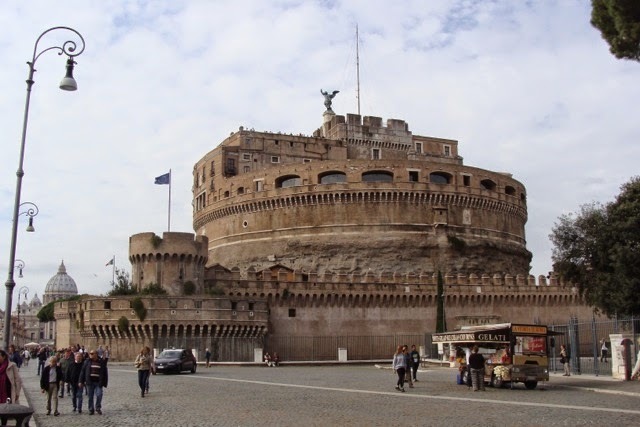 Used by popes as a defensive fort on the Tiber, other defensive surrounds were added later. 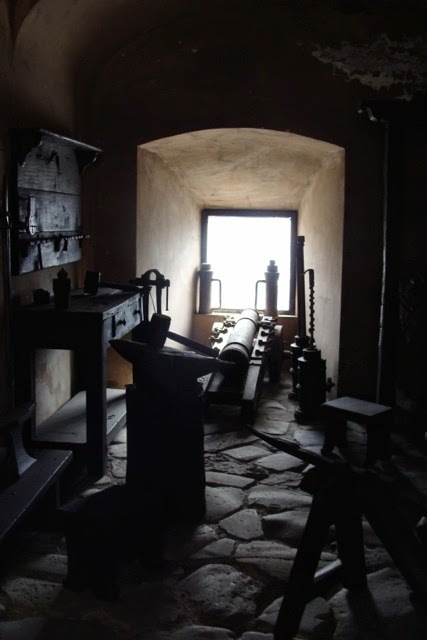 Some of the defensive towers were added by the Borgia pope, and some rooms have been restored to give you and idea of how the complex functioned. A walk along the parapet give you wonderful views of Rome, and a nice restaurant was there to give us liquid sustenance. We also run into two guys who ate next to us last evening at Fattoincassa. They are from Australia, and we exchange pointers and restaurant recommendations. Very nice. 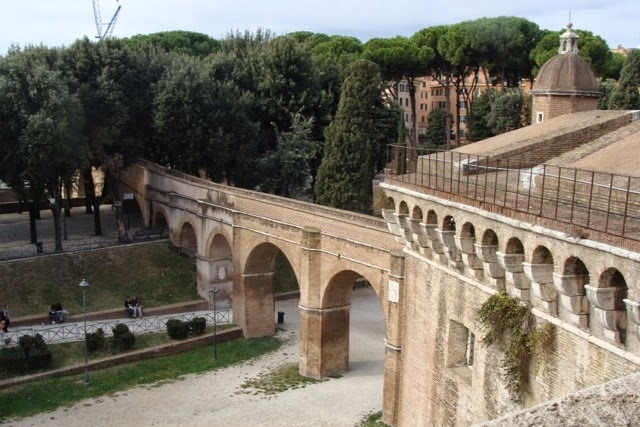 From the parapet you can see the covered walkway that winds from the Castel to the Vatican, a protective escape route for popes and entourage. There are grand rooms inside which indicates its use, as the tutorial advises, as a “luxurious prison” for some persons of note. 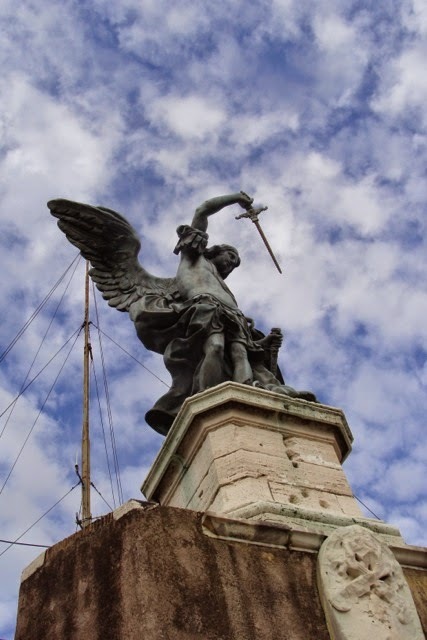 At the top, underneath the towering statue of Michael are rooms devoted to the Italian Army along with a fascinating video of Il Duce trying to reproduce a Nuremburg type rally in front of the Palazzo Venizia in Rome. From here we decide to go over to Saint Peter’s, which given that it is now Sunday afternoon, is probably not a good idea. It isn’t. 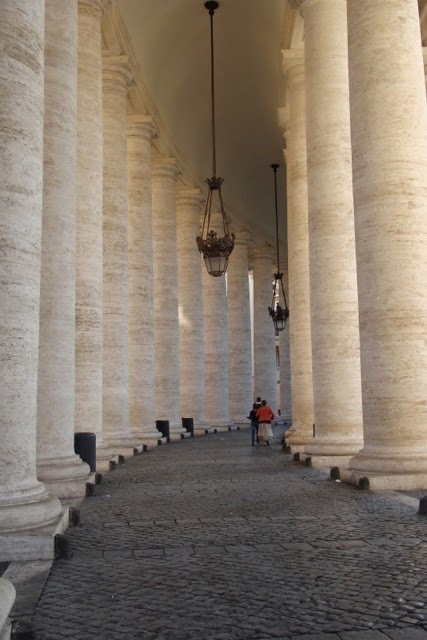 The line into the Basilica stretches around the greater part of the Bernini Colonnade, so we dump the idea. We notice, however, movement coming out of the great church (which reminds me of the entrance of Ptolemy in the movie Cleopatra in 1963. (You can see what I mean by clicking on this link: http://www.youtube.com/watch?v=umyyBo4rXGQ, and go to 4:20 or so). 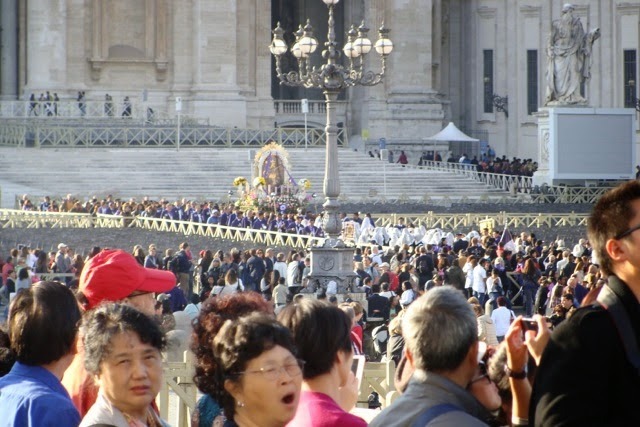 A large image with men and women dressed in purple escorting it out of the church enters the main piazza. They are from Peru, and are delighted to be here. 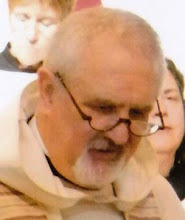 It puts us on the divide between our austere Protestantism, and what seems to be Dionysian delight in images and processions. I am entranced. Wendy and Bonnie go off to view the colonnade, and I wait for them. The entire Bernini surround has been cleaned over the last few years - and it gleams in the sun. We drop by the museum shop where I see a few Patarino porcelains. I talk with the salesperson about them, and appreciate the gift given so many years ago by A. R. Kretzmann that now adorns our house. We go back, find a restaurant, and have a delightful dinner – and then bed. 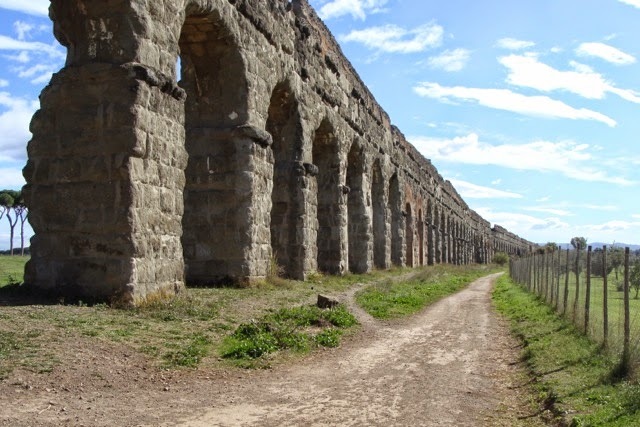 On Friday we have made arrangements to take a tour down the Appian Way, an ancient Roman road that stretched from Rome proper (the first mile marker was at the Circus Maximus) all the way down to Brindisium a port city on the Adriatic. It was a military road that was designed so that five soldiers could march abreast. Like other Roman roads leading into a city, this one was also lined with tombs, some grand and some rather understated. 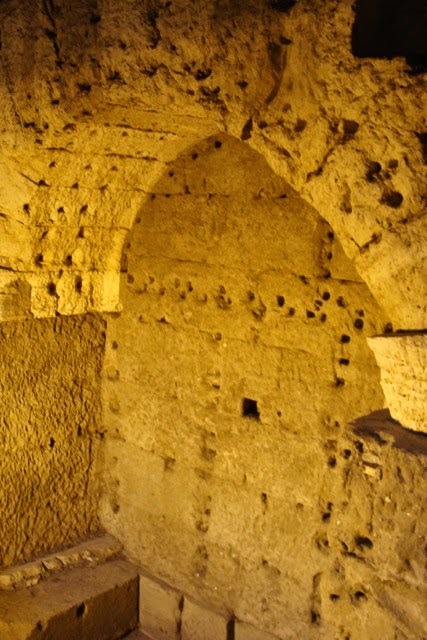 We first stop at the catacombs of Saint Calixtus, which tunneled under 150 acres of donated land to the south and east of Rome. The tunnels themselves are a web of intersecting and layered pathways, leading to thousands of burial places. Some are grand, having been decorated with stucco and paintings, and other are simple hollowed out places for the remains of the dead. The areas visited by tourists have had their bones removed, but many of the sites closed off from visitors still have bones lying there. It was less impressive than I thought it would be. Back out upon the way we see the remains of the original road in especially good condition. Sections evident in the forum and other places are a little worse for wear, but this section is especially fine. There is even evidence of wheel ruts in the stone. The original condition was much finer – a smooth surface stretching for miles. The roadways were built like walls, with several courses of stone, gravel, sand and cut stone to make them permanent. That is why the roads were called strata. There are pleasant reminders that we are out in the countryside, with white, pink, and purple flowers blooming on the vines that line the road. There are villae, both ruined and new, that still line the road, with palms and cypress blowing in the light winds that refresh our walk. Our next stop is the Claudian Aqueduct that runs from the mountains to the south and west of Rome into the city at the porta maggiore. It is majestic, and the engineering is incredible, maintaining a gradient that would allow the water to flow by gravity feed into the city. All around there are umbrella pines, and horses, which delight Wendy. The tour is too short (three hours), and we hustle back into the city. There is a strike (naturally – this is Italy) on the metro, so the traffic is horrific. We get off near Termini, and walk over to Santa Maria degli Angeli et Martyri, a church that repurposed the Baths of Diocletian (at least the tepidarium) into a rather magnificent church. Of special note is the meridian that runs along the floor from the southwest corner almost to the chancel. 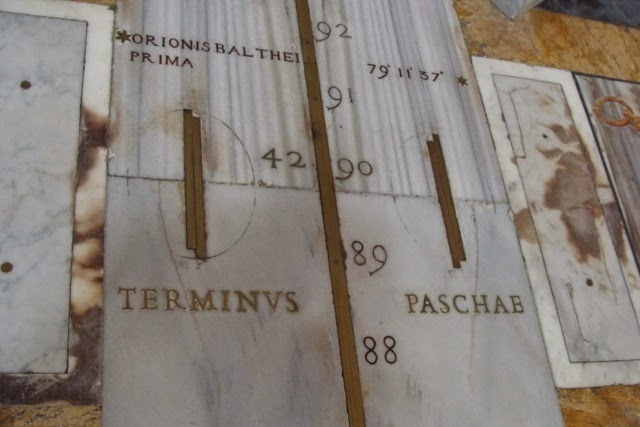 Each day of the year is marked, along with a special tablet that allows the dating Easter (the whole purpose of the exercise) and tracks constellations as well. It is fascinating. I wanted Bonnie and Wendy to see it because it gives some indication of what the ancient Roman baths looked like, with their marble cladding and statuary. We go to a restaurant in Republica and have lunch. 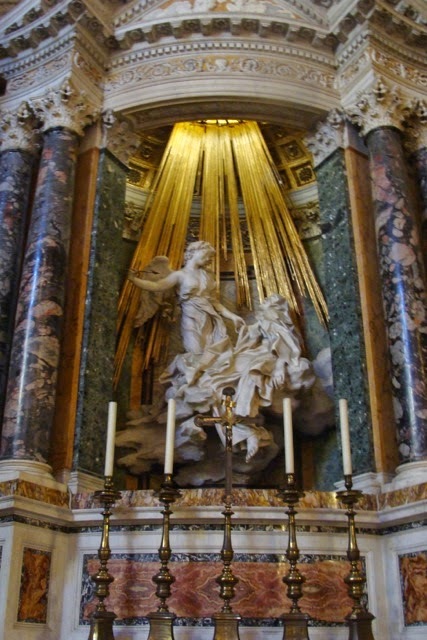 Our original intention was to go see Bernini’s St. Theresa in Ecstasy, but that will have to wait until tomorrow. Bonnie and Wendy take a cab back to the apartment, and I wonder off. 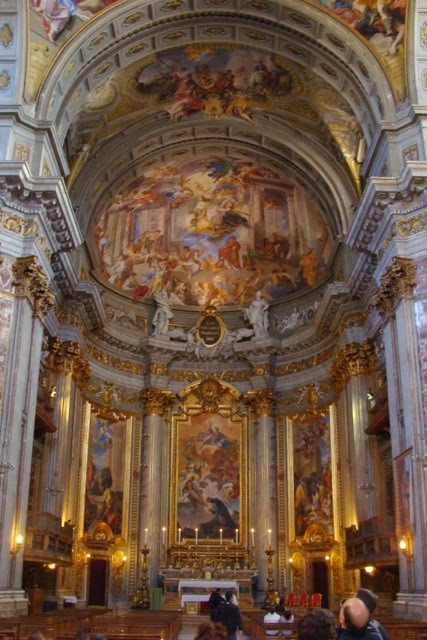 Making my way back, I go into St. Ignatius Loyola Church, with its magnificent and over-blown baroque interior. 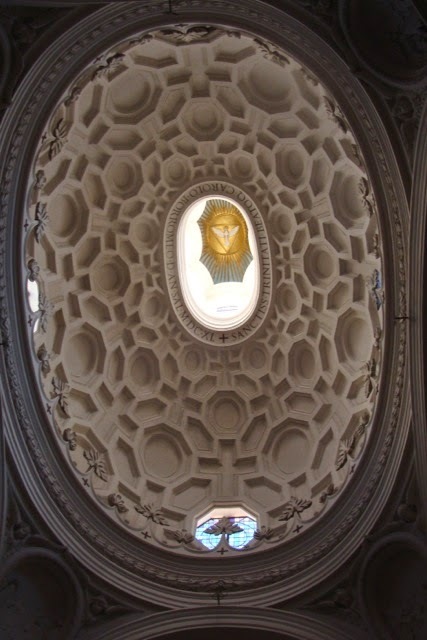 The optics of the tromp l’oeil in the central dome is something I have wanted to see for some time. I enjoy the decoration of the place and spend some time there. We have a reservation at the Vatican Museum for their Friday Night opening, so we cab to the door and wait until 7:00 when the doors open. We follow the Anna rule, each going their own way, agreeing to meet at the Pigna at 9:00 for dinner. 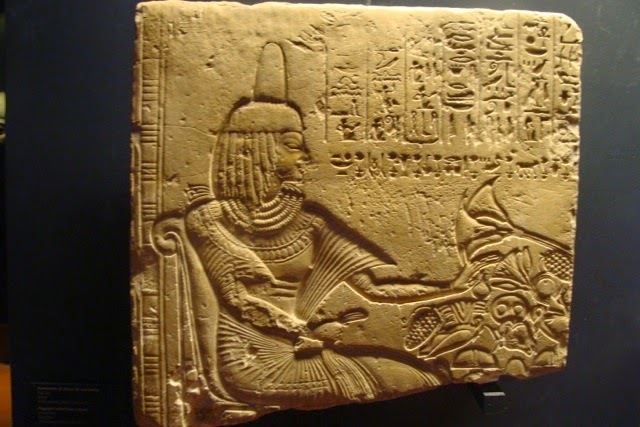 I especially enjoy the Pio-Clemenino Museum for its Egyptian and Assyrian collections. Unfortunately the Etruscan wing is closed. 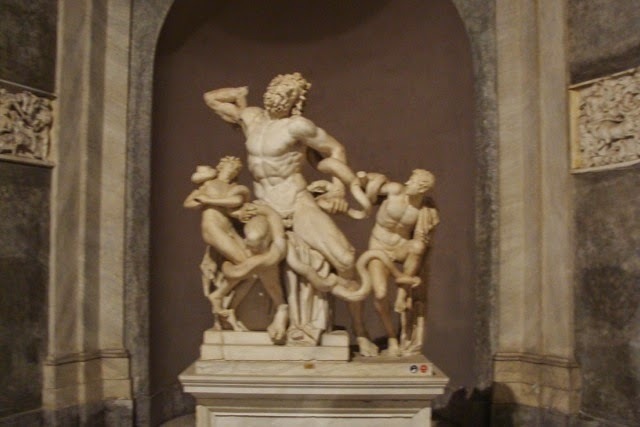 Next are several galleries of sculpture, which include the Laocoön and the Apollo Belvedere. One can only pause to view and study a few pieces of the collection, so I sort of wander, picking and choosing what I want to spend time with. It’s interesting to look at the Rafael apartments at night – the light is so much different. These rooms are crowded and so intensely interesting. 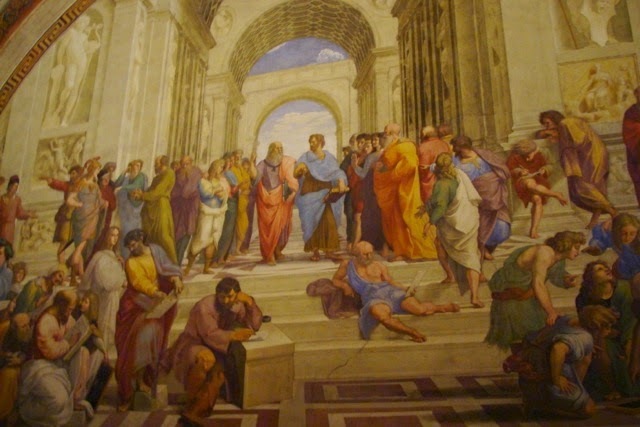 They give me pause as I work my way slowly to the Sistine. Many people in frenzy to reach the Sistine Chapel ignore a nice little collection of contemporary art along the way. Here you an experience Otto Dix, Orozco, Ensor, Sutherland, Burchfield, Epstein, Shahn, Rouault, Botero, and others. 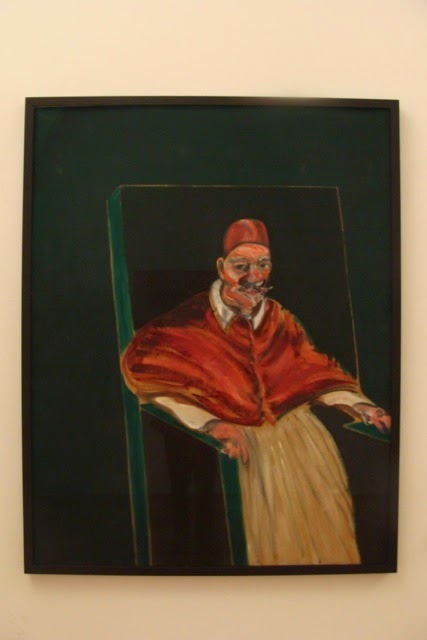 Two notable exhibitions are maquettes by Matisse for the windows, walls, vestments, and vessels at the church at Vence, France, and a portrait of Innocent X by Francis Bacon. 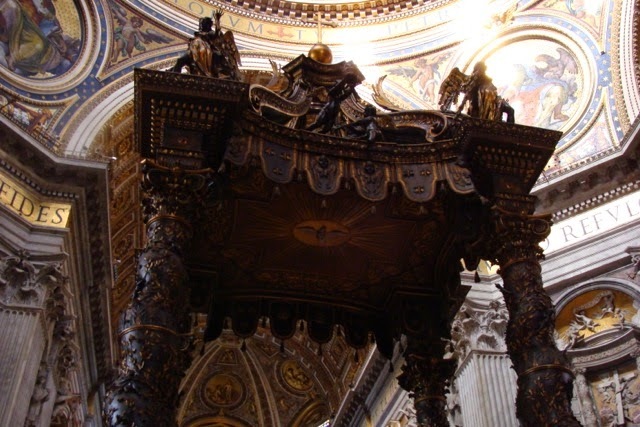 I wonder if he had given to the Holy See one of the screaming popes in this series, whether it would have been exhibited. It is a shame that people ignore the collection. The Sistine is noisy in spite of the guards, "Silencio, per favor!" I wonder what it would be like to experience this room in holy silence with only a few people, but that is a privilege reserved for others. I enjoy looking at the Ghirlandaio, Botticelli, Perugino that line the walls beneath the Michelangelo. They too, I am afraid, are ignored. 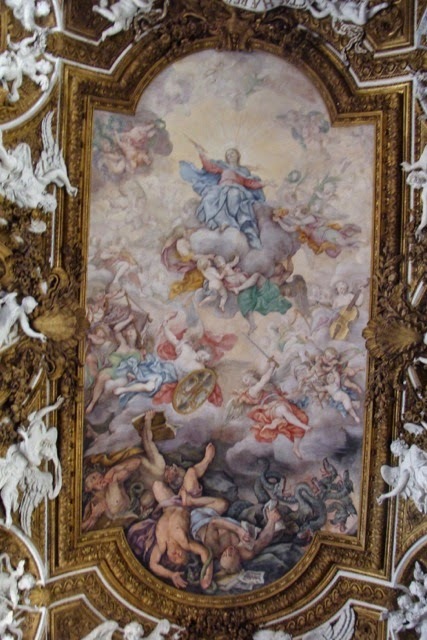 The goal for Saturday is to see Saint Theresa in Ecstasy at Santa Maria della Vittoria. On the way we pass a magnificent but crumbling baroque church. I so much want to go inside and see what is left. It appears abandoned. We work our way over from Navona, past Colona and over to Santa Susana – and it is closed until 13:30. So we go to Via Veneto, have a drink and snack and intend to walk down to the Capuchin church that Wendy saw on Wednesday, but run into a restaurant that calls out to us to have a hot dog (so delicious after all that pasta). We relax, and I remember that this is an important aspect to a vacation. We sit and wait and talk – it is delightful. Bonnie and Wendy go off on their own again, and I want to go see the Quattro Fontane. On the way there I pass by St. Paul’s Church inside the Walls – an Anglican/Episcopal Church, the first protestant church allowed within the walls of Rome. It is largely a donation of J.P. Morgan, and its interior with mosaics by Edward Burne Jones is quite impressive. I spend some time as no one is there, and it is very quiet and cool. A German lady asks me, “Why is no one in this beautiful church?” I am at a loss to answer why. Like so much else in Rome, the fountains, which depict the Rivers Tiber and Aniene, and (perhaps) the goddess Diana, and Juno, are being restored – so I cannot see them. 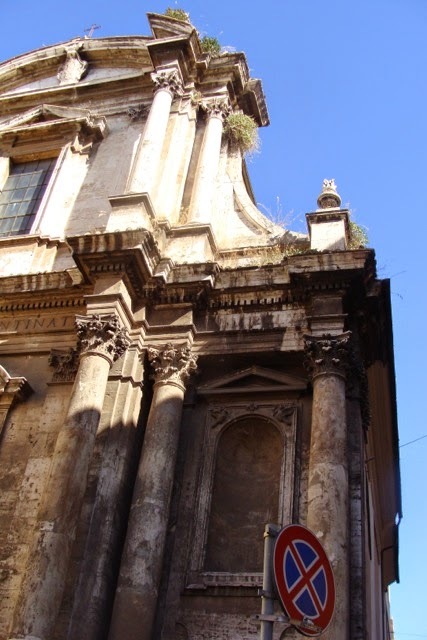 Next door, however, is the baroque Church of San Carlo alle Quattro Fontane. 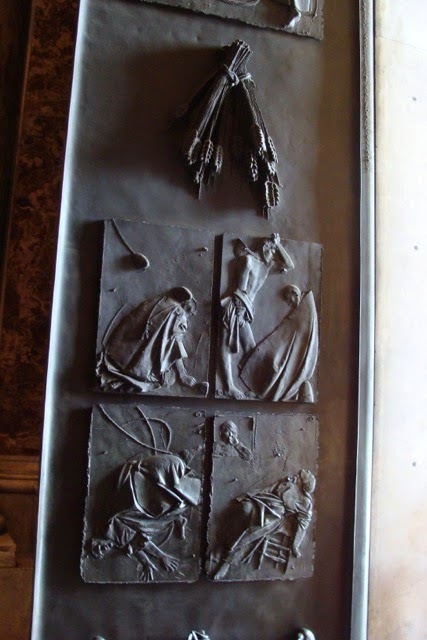 As you can see from the picture, this church is a relief from the baroque. 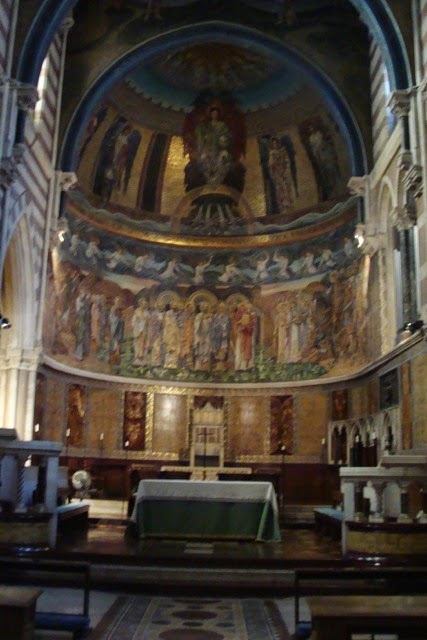 It is quiet, almost classical in its arrangement of space, and a palate cleanser from the earlier riot at Santa Maria della Vittoria. Refreshed I walk home to a lovely dinner with my sisters, and a quiet night's rest. We are about to move into daily life, both modern and ancient. 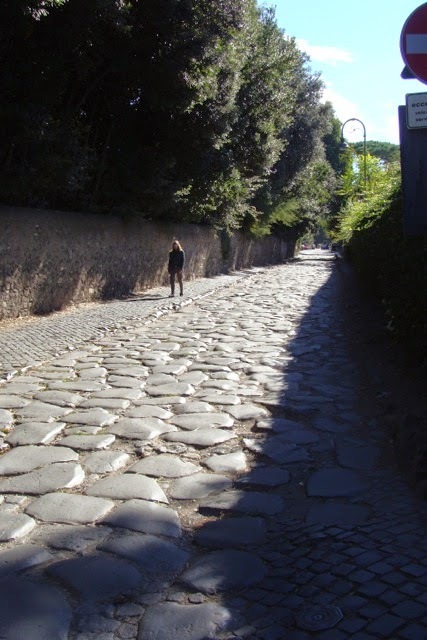 We walk to the Colosseo metro station and take linea A to EUR Magliana and transfer to the Ostia line to Ostia Antica. The metro is full of life – everyday life. It’s interesting to watch people go about whatever their business is, and it leads me to wonder what their life is like (where they live, what they do, what their mood is, etc.) Bonnie was hoping for a nice train trip, comfortable seat, a window, scenery passing by, but none of that was to be had. Like the Romans on board, we too stood and waited for the station we wanted. 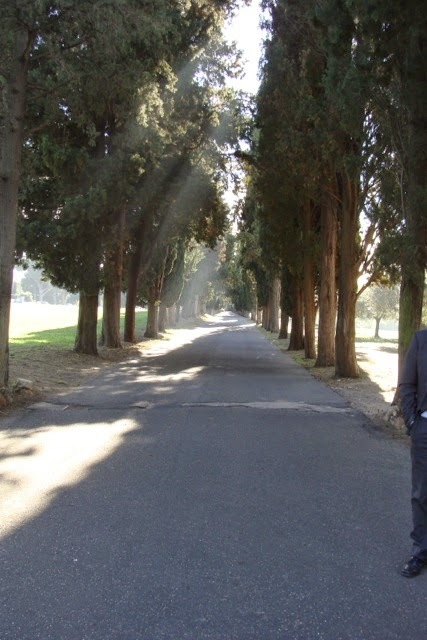 Just as in Rome along the Via Appia, the entry into Ostia Antica from the east is a highway through tombs. To enter the city teeming with life one must first honor the dead. Like the cemeteries that we know, these tombs are a mixture of simple and ornate, stone and brick. The ornate brickwork shown above is outstanding. 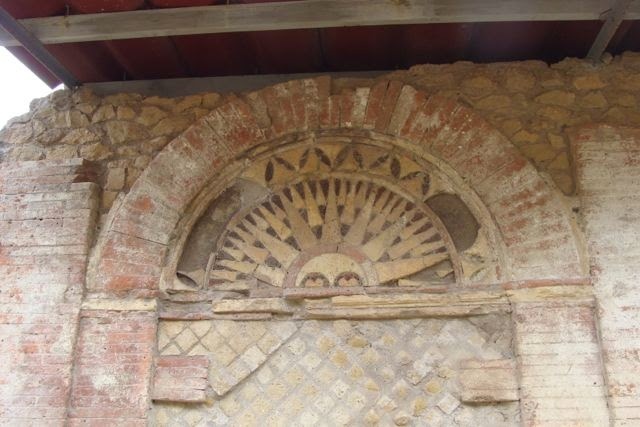 In fact there was a college of brick workers in Ostia, their headquarters still standing. In that building we can see the pride they took in their work. Once through the gate and into the city one sees rows of storage and workhouses, and then there is pleasure and health. 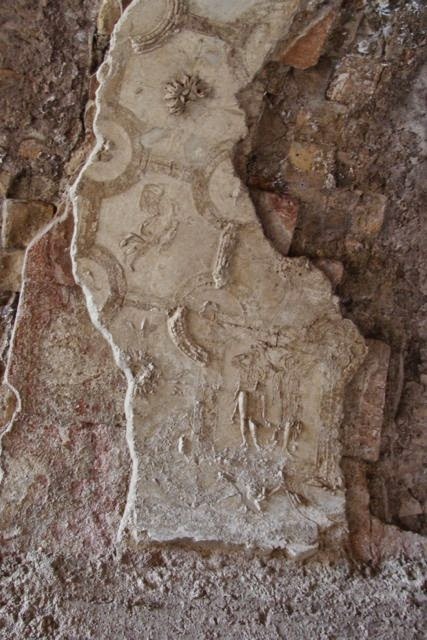 At the Thermii Cisarii we see a large array of rooms, the floors of which are all mosaic. It was here at the baths of the cart drivers that we get to see some wonderful work both ancient and modern. 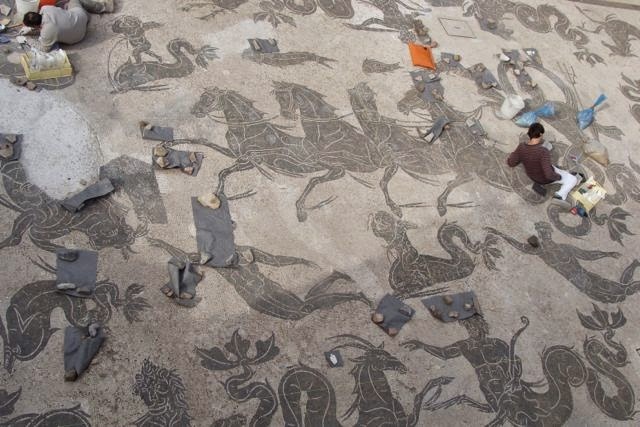 The mosaics are black and white, but wonderfully ornate – depicting gods and goddesses and all the mythos of the Romans. Working on the floor, however, are curators and restorers as they work on each of the floors. Some are covered for a time, to save them from the elements, and others are left for us to see, and even more are in the process of restoration. 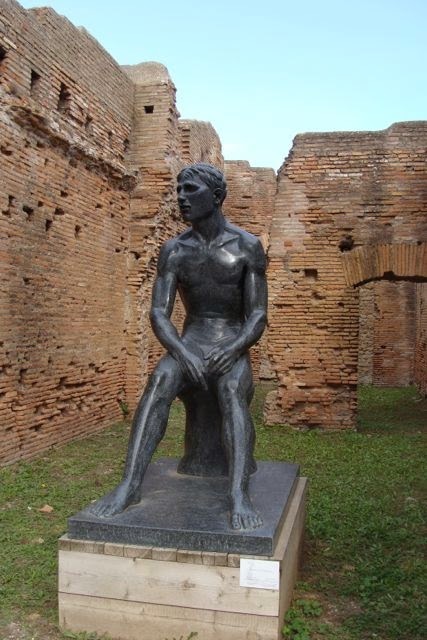 One thing that has been added to Ostia Antica is the placement at various places in the town of contemporary sculpture, most of it with a classical feel. Some of the placements work quite well, so that you don’t get the feeling that you have stepped out of time. Again, like the Neronian Cryptoporticus on the Palatine Hill there are examples of stuccowork that have survived. The work shown here is at the theater, in the central aisle that serves as an entrance to the seats. What is interesting about this work is that if you look closely you can see the work of the artisans in sketching out the placement of stuccowork that was placed later. Again, a reminder of human daily life and work. To the rear of the theater is a “mall” of sorts, lined with the stalls for the various corporations that plied their trade at Ostia’s harbor. In the front of each stall is a black and white mosaic depicting fish, ships, rivers, or gods, meant to indicate the kind of work the corporation was involved in. 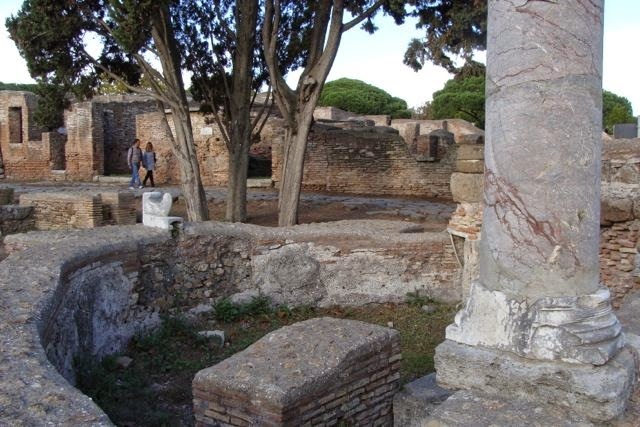 After a “lunch” at the bookstore/restaurant on the site, we go to the forum of Ostia and see the remains of a large Pantheon-like circular structure that sits opposite the Curia in Ostia. To the west and a bit behind is a shrine where the town Lares sat, and lovely example of brickwork. 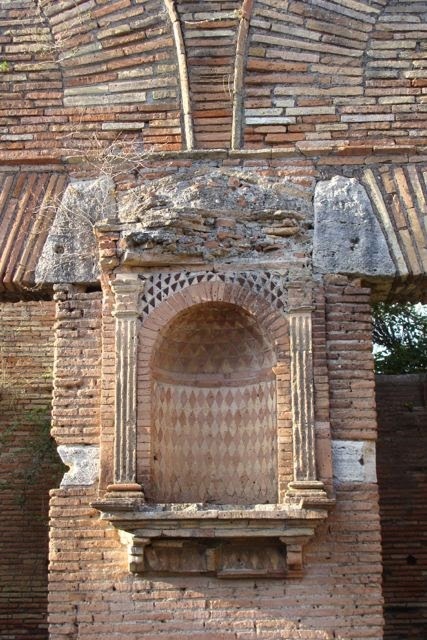 There are other sacred places in Ostia, temples, and shrines, and a couple of Nymphaeum. 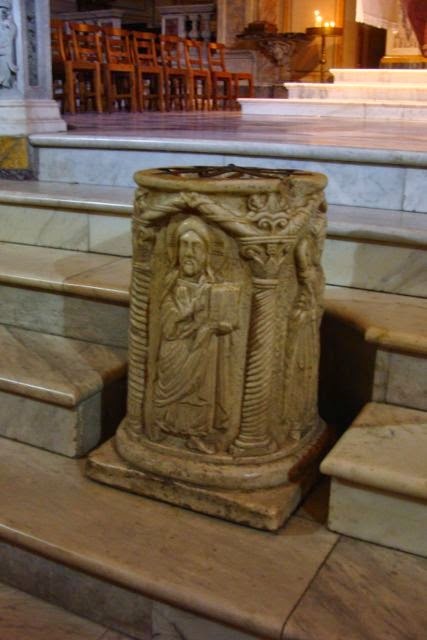 The one pictured below was later converted to Christian use as, I suspect, a baptistery. In fact a martyr is honored with a plaque here. There is a Synagogue in the forum area and at least one Mithraeum as well. 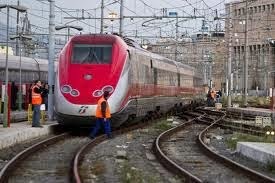 The sun begins to sink slowly in the west and we take a train back to Rome, getting off at Circo Maximo. 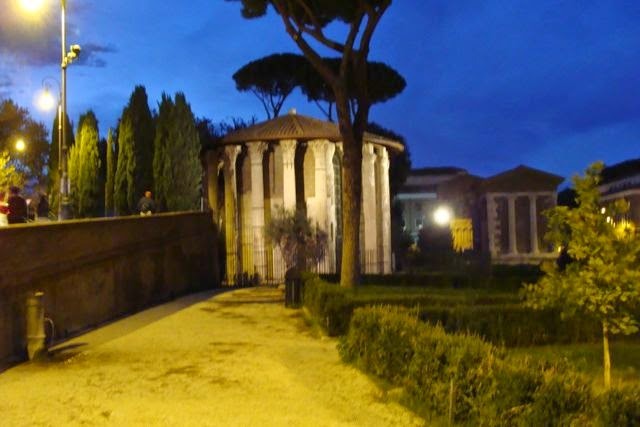 We decide to walk over to Trastevere to have dinner, so we walk along the circus, making a brief stop by the Temple of Vesta on the banks of the Tiber. It is a lovely building and I’m sorry that we can’t stop in to see Sancta Maria in Cosmedian that sits right across the street. We take the bridge that connects Isola Tiberina with both the east and west banks. At the end there is a church dedicated to Saint Bartholomew, which also serves as his burial place. My friend Barton and I bumped into this place in 1989, and I wanted to show it to Bonnie and Wendy. In the center of the stairs leading up into the chancel, there is a wellhead. It seems that in ancient times this was an asklepieion where healing and dream telling was done. The well is a remainder of that site, and is still use in healing offices. We make our way into Trastevere, and I get us lost. However, we are near a restaurant where people are standing in line to get in. Wendy sees the possibilities of something wonderful here and so we stand in line to get into da Enzo al 29. We do get in and it is flat out wonderful. We all start out with the Panzanella, a composed and moulded salad of bread, celery, tomato, basil, olive oil, and lemon – quite good. I have the Cacio e Pepe, a simple dish of wide spaghetti dressed simply with a very fine pecorino and lots of pepper. It was quite delicious. I followed that with Polpette, but quickly came to the opinion that the Polpette at Piccino in San Francisco are much better. I don’t remember dessert, which says something. We all agreed, however, that it was a superb experience and would go back in a minute. We walked back to Navona through Campo di Fiori. I really over-reached the walking part. I need to ask Bonnie and Wendy if we need to take a cab!